My patented Lumed MN™ Straps have an off-white or light grey (trident, black ops) luminous centerline with green lume. 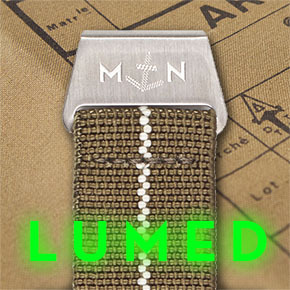 The lume can be loaded with natural or artificial light just like the luminous on your watch dial. The lume has a life span of 3 to 6 years with normal use. Although my MN Straps are fully adjustable I tailor them to your wrist size. 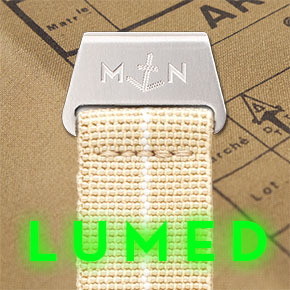 Each MN™ Strap is hand made to order according to your specifications. Usually it will take between 5 and 7 working days to finish your strap. Check the options menu for more info on buckle, stitching and printing options. 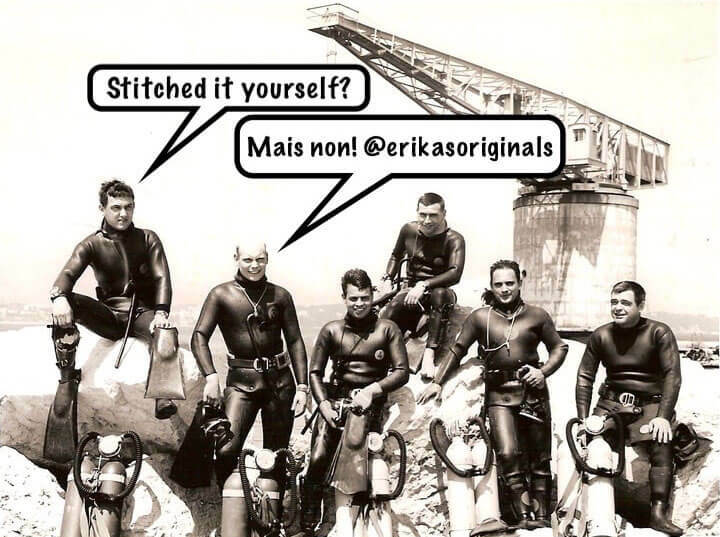 My MN™straps are made in the spirit of - and a tribute to - the Marine Nationale divers that hand stitched straps made of elastic webbing from their parachutes. Using the same elastic parachute braid that I am using for the MN straps today. Taking it one step further my design uses parachute hardware to make them fully adjustable and easier to wear both in and out of the water. It is not just the cool looks and the heritage that contributed to the success of the MN strap but also it’s comfort and wearability. The French navy - the Marine Nationale - has been long known for the outstanding watches they issued to their combat- and on board divers. Among these are divers watches from Tudor, Doxa, Triton and Z.R.C. Since these watches were delivered 'head only' to the French Marine Nationale, their divers used a variety of watch straps on them. Some of the divers used the, now famous, elastic webbing found on their parachutes to make a single loop watch strap for their own watch. I started making the MN-Strap watch straps when a watch enthousiast asked me if it would be possible to complement his M.N. 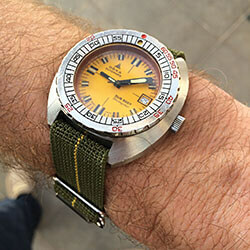 Doxa with the original strap as worn by the Marine Nationale divers in the 1970's. He wanted an adjustable one he could wear up and down his wrist as he pleased. Not a simple stitched together loop that would probably be too tight or too loose. Searching for the right material I bought some old parachutes and low altitude static lines to harvest the elastic webbing. I did a lot of experimenting. The Nato with a twist seems an obvious choice but since the material is elastic, a regular buckle does not work and the double layer of webbing under the watch makes the watch swing back and forth. Since I had all that nice original 1970’s parachute hardware (I took off the parachutes I bought) I started experimenting with that in combination with some hand made hardware. After only a few prototypes I ended up with the perfect adjustable MN strap. A picture of the Doxa with the prototype of the strap ended up on Instagram and immediately afterwards I received requests from New York, Paris, Stockholm and Singapore. Since then I get mails from all over the world and attention on different forums, podcasts, Instagram and Facebook. Needless to say I ran out of materials fast! 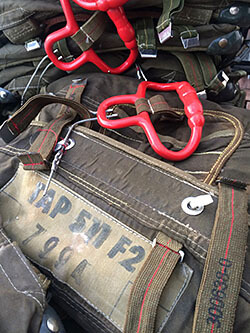 Thanks to the outstanding relation with my contact with the TAP, French Airforce, I managed to get my hands on rolls of new old stock parachute elastic. Never used but stored for over 40 years. 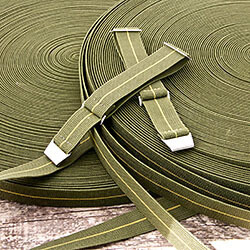 At the moment I have a mix of new old stock vintage material and brand new parachute elastic in various colors. The MN strap is made from Latex braided with Nylon. The Nylon is one of the contributing factors to it's comfort. Nylon (designed as artificial silk by DuPont in the 1930's is extremely comfortable to wear and absorbs and regulates moisture better than any other strap material which is a big plus in general but especially on warmer summer days. All my MN™straps are double saddle stitched by hand using the finest French Linen thread. 100% hand made with pride! Fields in red are mandatory. ! !Scroll down to select all the options!! 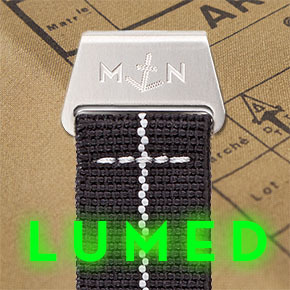 For Lumed MN™ Strap availability for 21, 23 and 26 mm lug watches please refer to the series product pages. 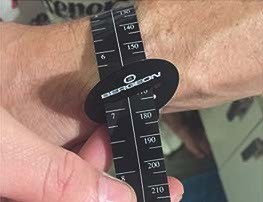 How to measure your wrist. If you do not have a wrist measuring ribbon like the one above you can measure your your wrist circumference with a strip of paper or string. After marking the paper use a ruler to measure the correct size. I need the tight measurement of your wrist. Please do not compensate for wanting to wear it a bit loose.